Besides the local native mallee Eucalypt species, many Western Australian species have been planted around the district. These have proved to be hardy trees, frost and drought tolerant and very pretty in flower. 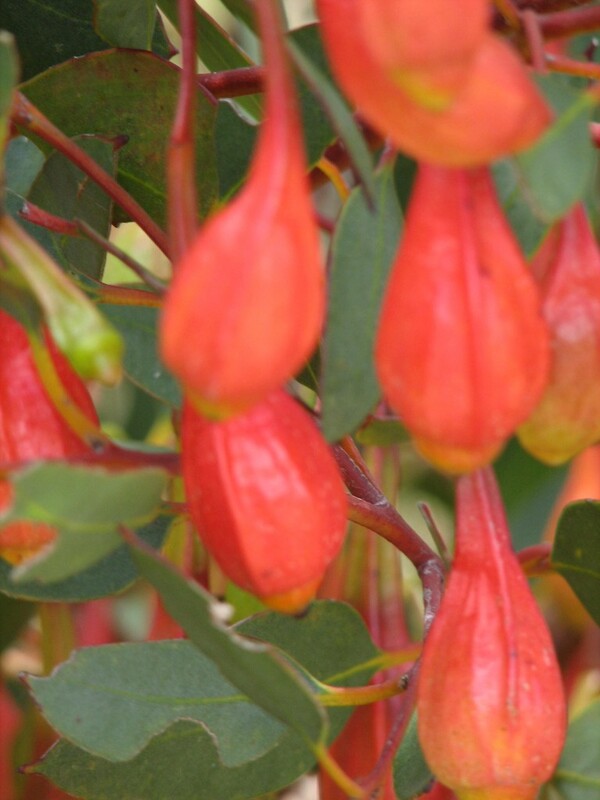 One of my favourites is Eucalyptus forrestiana (Fuschia Gum). This tree has attractive gum nuts (capsules) which have the appearance of a fuschia, hence the common name. It is often a tall shrub rather than tree like, being 3-7 metres high by 3-5 metres wide. It seems to handle the limestone here very well although it is probably in the smaller range so far as size is concerned. It makes a great tree for home gardens. The Honeyeaters love this tree when it is in flower. What method do you recommend for germinating Eucalyptus forrestiana seed? I have found conflicting and confusing information on the web and would sincerely appreciate advise from an experienced propagator. Please send as much detail as possible to my email address. Thank you very much. I have germinated E forrestiana by sprinkling seed on the surface of the seed raising mix, covering lightly with seed raising mix to the depth of the size of the seed, and sprinkling a light layer of small washed gravel over that, to act as a mulch which stops wild fluctuations in temperature, and retains moisture on the surface of the pot. Germination seems best at 20-25 degrees C.
My source says that only about 25% of viable seed produces a seedling that gets to planting out stage. Seed remains viable for 4-5 years stored at room temperature, and lasts longer if refrigerated. What does one need to do to get the Seed out of the Capsule?